ASCII art is just one of those wonderful retro throwbacks to the earliest days of computing. So, if you’re looking for a nostalgic return to the the days of BBS, MUD, and IRC, and perhaps a little bored at school or work, why not watch the entirety of Star Wars Episode IV: A New Hope discretely thanks to being rendered entirely in ASCII art? 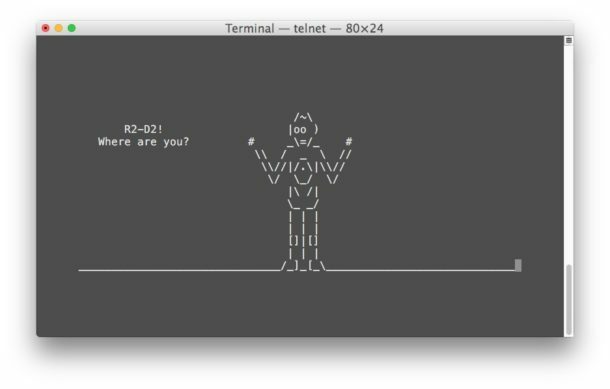 Yea seriously, you read that right, you can watch Star Wars in ASCII art, so live your wildest dreams because we’ve got you covered here, thanks to a fully rendered ASCII version of the movie that you can access with Telnet via your command line of just about any modern operating system with a command prompt. Now just sit back, relax, and enjoy Star Wars, all drawn in ASCII art, subtitled and all. Now, I’ll be very impressed if you can get through the entire thing, but I’m sure many do. And yes seriously this works on any platform with a telnet client, so even if you’re not going for the nostalgia because you’re actually stuck in 1993 with Windows 3.11, as long as you have a telnet client, your life can be saved with Star Wars: A New Hope. Oh, the joy of ASCII, what would we do without thee? this made the day at the office, thanks! dumbest thing I’ve seen! I remember this! I think it went offline a while back, it’s nice to see it’s still around. I must obtain the latest star wars theme on my Tom Tom GPS. Looks like It is fantastic! I really love the recently released star wars adidas film. It definitely made me laugh.